The MIT-trained scientist transformed meditation from a Buddhist practice into a scientifically based approach to a more meaningful life. 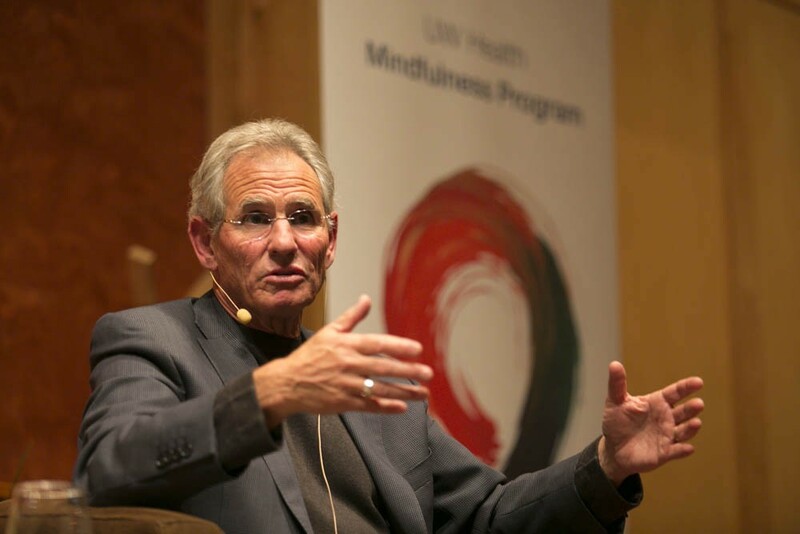 Jon Kabat-Zinn discusses mindfulness at a 2013 conference hosted by the University of Wisconsin-Madison. Credit: UW Health. Creative Commons. Five years ago when I first took an interest in meditation, my introduction to the practice was Jon Kabat-Zinn’s 1994 book Wherever You Go There You Are. As a scientist, Kabat-Zinn pioneered some of the earliest research on the health benefits of meditation, but it was through his popular books and media appearances that he introduced generations of curious readers to the philosophy of mindfulness. My copy of Wherever You Go There You Are was soon marked up with notes. I moved on to reading Kabat-Zinn’s 2005 book Coming to Our Senses and then to his classic volume Full Catastrophe Living, in which he details his 8 week meditation program that today is widely used across clinical health settings. Inspired by Kabat-Zinn’s writings, I began to meditate daily. Sitting in a quiet room, outside at a park, or on the train to work, I would assume an upright relaxed position and focus on my breath. My meditation practice was not about making my mind empty or blank but simply letting my mind be at rest. As thoughts or feelings arose, I would observe them without judging them. For example, if a thought about the need to finish an article popped into my head, I would silently label the thought “worry,” before returning to focus on my breath. I began to realize that the contents of my conscientiousness could be observed, and that the accompanying emotional reactions to them were seldom grounded in reality. In the years since first reading Wherever You Go There You Are, I have paired meditation with a daily yoga routine. I also have read as much as I can on the history, philosophy, and science of mindfulness. The story of the movement’s origins, the process by which meditation has gained scientific legitimacy, and the adoption of the practice among (mostly) well-educated, affluent Americans is fascinating and revealing. In this article, I take a first look at what scholars have written about Jon Kabat-Zinn’s role in the growth of the mindfulness movement. In future articles at Wealth of Ideas, I will examine in more detail various debates over the scientific evidence related to meditation and health; the origins of mindfulness in a variety of Eastern traditions; the factors accounting for its spreading popularity; and the concerns raised by some scholars and practitioners about its transformation into a “killer app” for self-improvement. Meditation is used widely today by health professionals to treat depression, anxiety, post-traumatic stress disorder, pain, insomnia, eating disorders, relationship problems, and other conditions, write the historians Ann Harrington and John Dunne in a 2015 article. Professional athletes use meditation to improve their performance, as do CEOs and Silicon Valley programmers. Meditation is similarly taught in schools and colleges as a way to help students (and teachers) better regulate their emotions, to improve concentration, and to manage stress and anxiety. Most scholars trace the concept of “mindfulness” to the Pali words sati, which in the S. Asian Buddhist tradition implies awareness, attention, or alertness. Some also link mindfulness to the term vipassana, which means insight cultivated by meditation. But as Jeff Wilson details in 2014’s Mindful America: The Mutual Transformation of Buddhist Meditation and American Culture, similar breath-attention techniques are also found in Tibetan Buddhism and in the Japanese Zen meditation practice of zazen. All three strands of Buddhism influence approaches to mindfulness today. Historically, in Buddhist cultures, monks and nuns practiced meditation, not the broader population. For the ordained seeking the path to enlightenment, meditation was an instrument to facilitate asceticism, detachment, and renunciation. Jeff Wilson discusses Mindful America: The Mutual Transformation of Buddhist Meditation and American Culture as part of the Tricycle magazine podcast. Yet during the late 1800s, when the British took over the country of Burma, a monk named Ledi Sadiyaw embarked on a campaign to urgently spread the practice of meditation to the lay public, racing to preserve Buddhist culture in the face of Western colonization. Similar efforts took place in other S. Asian countries, write David McMahan and Erik Braun in the introduction to their 2017 edited volume Meditation, Buddhism, and Science. As trade with Asia increased, Westerners also began to take an interest in Buddhist teaching by way of pamphlets, books, and journals. Despite this interest, meditation did not emerge as a focus in the United States and Europe until the 1960s when reforms in immigration policy enabled hundreds of thousands of Asians to emigrate to the United States, including several prominent Tibetan and Zen missionaries who founded Buddhist centers and toured college campuses. Courses on Buddhism at the university level soon followed, offerings that were popular among students seeking counterculture alternatives to Western paradigms. Some of these students traveled to South Asia to study Buddhism or discovered meditation as part of the Peace Corp.
By the 1970s, three main sources of meditation-focused teaching appeared “that would become the most important wellsprings of the American mindfulness movement,” writes Wilson. In 1976, Joseph Goldstein, Jack Kornfield, and Sharon Salzburg founded the Insight Meditation Center in Barre, Massachusetts. Having studied Buddhism in Asia, their goal was to create a retreat center that could emulate in an American context what they had experienced. In their teachings, articles, and books, the trio deliberately downplayed elements of chanting, ceremony, and cosmology, notes Wilson. Instead, they focused on meditation and mindfulness, integrating elements of Western psychology and psychotherapy. The second main force in the rise of mindfulness was the Buddhist monk Thich Nhat Hanh. Exiled from Vietnam, he gained prominence during the 1960s as a speaker and activist against the war. By the mid-1970s, he shifted to focus on the promotion of mindfulness and meditation, publishing the Miracle of Mindfulness and more than 100 subsequent books. Today, some 350 official meditation practice groups are affiliated with Hanh’s teachings. Along with the Dalai Lama, he is the world’s best known Buddhist, notes Wilson, having appeared on Oprah Winfrey’s talk show numerous times and annually touring the United States. Yet arguably Jon Kabat-Zinn may be the most influential figure in the acceptance of mindfulness as a secular and scientific practice. As a student at MIT, Kabat-Zinn was introduced to meditation by a Zen missionary. He went on to study at the Providence Zen Center, at the Insight Meditation Center, and with Thich Nhat Hanh, drawing on these and other traditions to inform his own approach to teaching mindfulness. After earning a doctorate in molecular biology, Kabat-Zinn in 1979 started a stress reduction center at the University of Massachusetts Medical School, developing an eight-week Mindfulness-Based Stress Reduction (MBSR) course. Kabat-Zinn’s key innovation, writes Wilson, was to take the traditional week-long meditation retreat, inaccessible to those with busy lives, and to offer participants classes that took place once a week for two months. Participants, who usually numbered between thirty-five and forty per course, were assigned guided meditation recordings to use at home for forty-five minutes each day for the duration of the course. They were also instructed on how to be mindful of their breath during their daily activities, expanding the “thread of meditative awareness” into every aspect of their lives, writes Kabat-Zinn in Full Catastrophe Living. Jon Kabat-Zinn discusses the art of teaching mindfulness at the 2018 Wisdom 2.0 conference. Just as important, the course was able to be offered across clinical and institutional settings. Instructors, many with advanced degrees in the mental health professions, were required to complete an intensive certification process and to keep their training up to date. With the practice of meditation transformed into a clinical intervention, the effects on a range of mental, physical, and behavioral outcomes could be evaluated and published in the peer-reviewed literature. Yet to gain legitimacy within the medical community, Kabat-Zinn also understood that he needed to strip his approach of any overt religious connections, framing mindfulness as a mental skill acquired through meditation that involves “paying attention in a particular way; on purpose, in the present moment, and nonjudgmentally” he writes in Coming to Our Senses. Through the promotion of mindfulness, meditation could help patients manage the suffering associated with illness, reasoned Kabat-Zinn, by enabling them to be more accepting of their experience, which in turn would lessen pain, anxiety, and depression. Most would still need traditional medical treatment, but meditation could help speed the recovery process and prepare them to successfully navigate future experiences and decisions. By the late 1990s, Kabat-Zinn had transformed meditation from a practice rooted in Buddhism to that of a scientifically based form of health promotion. Meditation was now the “property of psychologists, doctors, scientists, and diet counselors and to be engaged in by clients rather than believers, who are not expected to take refuge, read scriptures, believe in karma or rebirth, or to become Buddhist,” writes Wilson. Today, more than 600 studies are published annually on meditation and mindfulness. Observational studies evaluate the efficacy of meditation on health-related outcomes and school performance. Other studies investigate how meditation might influence parts of the brain linked to positive emotions, cause some parts of the brain to grow, and be related to changes in brain wave activity among experienced practitioners. Yet as widespread as meditation has become in clinical settings, schools, and the business sector, many of the scientific findings have not yet been sufficiently replicated. Most researchers in the field are enthusiastic meditators themselves, enabling them to apply important insights but also potentially biasing their conclusions. Like in psychology more generally, there is a strong bias toward publication of positive or significant results. The methodological rigor of many studies also remains low with few longitudinal control studies conducted. During the 1990s, even as scientific research on the benefits of meditation remained limited, popular interest in mindfulness blossomed, expanding beyond clinical applications to focus on a quasi-spiritual approach to life. At the ubiquitous super-stores Barnes & Noble and Borders, Americans could purchase previously difficult to find magazines such as Tricycle: The Buddhist Review and the Shambala Sun along with books by Goldstein, Kornfield, Salzburg, Hanh, Kabat-Zinn, and many other authors. The Chinese occupation of Tibet, writes Wilson, also brought worldwide media attention to the Dalai Lama along with acclaimed Hollywood movies about Tibet such as Seven Years in Tibet, Little Buddha, and Kundun. For sports fans and athletes, Phil Jackson, coach of the champion Chicago Bulls, related in interviews how he had encouraged Michael Jordan and other players to practice meditation. The 1993 Bill Moyers PBS series “Healing and the Mind” featured Kabat-Zinn and his MBSR approach, turning his books into best sellers. Episode from 1994 PBS Bill Moyers special on “Healing and the Mind” profiling Jon Kabat-Zinn. By the 2000s, with books, talks, and documentaries about mindfulness instantly available via Amazon, Netflix, and YouTube and guided meditations downloadable to smart phones, public interest in mindfulness exploded. As of 2012, an estimated two million American adults reported having practiced some form of meditation within the past twelve months.